Replace the breadcrumbs with crushed cashew or pistachio nuts for a gluten-free option. of tinfoil, skin side down. Put the breadcrumbs into a bowl with the thyme leaves, lemon zest and a pinch of black pepper. Stir to combine, then add the olive oil and lemon juice. Top each fish parcel with the crumb mixture. Scrunch up the foil around the fish but leave the top open. 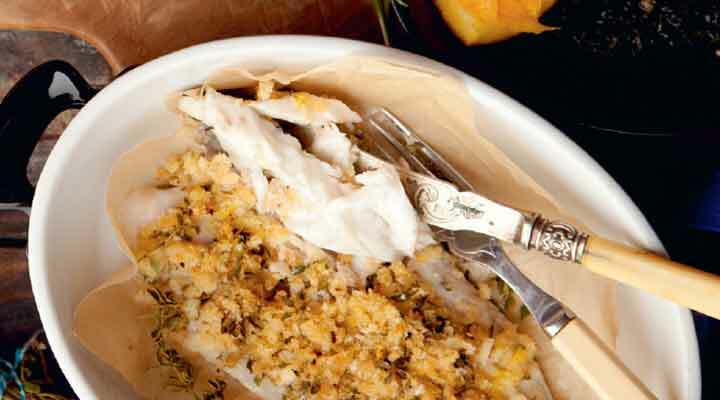 Pour 1 tablespoon of wine around each fillet and bake for 15 minutes, until the fish flakes easily.